Looking to do some good to help your community? Philadelphia is a city that offers many places to volunteer, all very different. You’re sure to find some that fit your schedule and align with your personal reason for wanting to give back to your community. 54 St. and Lindbergh Blvd. Volunteer at the oldest surviving botanical garden in North America. Bartram’s Garden is looking for people to volunteer in the Green Room and Garden Shop. If you’re free on the weekends, bring your gloves and join the monthly Second Saturdays public volunteer events from March to October, 9 a.m. to noon. Projects are available for all levels of expertise. Check the events calendar for special volunteer opportunities, including their annual MLK Day of Service or email lgale@bartramsgarden.org for more information. Plus, volunteers who give 10 hours of their time over a year receive a complimentary Gardener Membership, which provides free admission to member-only events, discounts to retail items and workshops, and unlimited access to the Green Room. Do you have a free summer and love working with kids? Have a teen that’s interested in gardening and the outdoors? This historical site is looking for Leaders-in-Training volunteers to help out at the summer camp programs. Candidates must be at least 14-years-old and have experience or interest in one of the following topics: teaching, Philadelphia/Germantown history, gardening, agriculture and/or horticulture. LITs must volunteer at least 1 week sometime between June to August. Those interested must fill out the LIT application on the Wyck website. Call 215-848-1690 or fill out a contact form for more information. P.O. Box 419, Millheim, Pa. | 1208 Horseshoe Pike, Downingtown, Pa.
Brown St. & N. 49th St.
1 Penn Center, Suite 900 | 1617 John F. Kennedy Blvd. The South Philly Food Co-op needs volunteers for their many events. Opportunities include lending an extra hand at events like a soup swap or volunteering a special skill such as accounting, social media, writing, research and more. Check out the events calendar, fill out the Volunteer Interest Survey or get in touch with volunteer@southphillyfoodcoop.org to find out more about upcoming opportunities. 1 Parkway Building, 10th Floor, 1515 Arch St.
Volunteer with Friends of the Free Philadelphia Library to help support and organize an important community staple: the library. Volunteer groups work with library staff members to increase their library’s resources, raise money to pay for programming for children and adults, work on library gardens, run bus trips, host classes and much more. To get involved, call 215-567-4562 or contact Tessa Renshaw at tessa@libraryfriends.info today. 14th District, District Headquarters, Haines St. and Germantown Ave.
Help support Wissahickon East Project’s work to stop illegal waste dumping and reclaim the Cresheim Woods for the community. Volunteers will be able to help with things like fundraising, website design, community organizing, street and park clean-ups and much more. 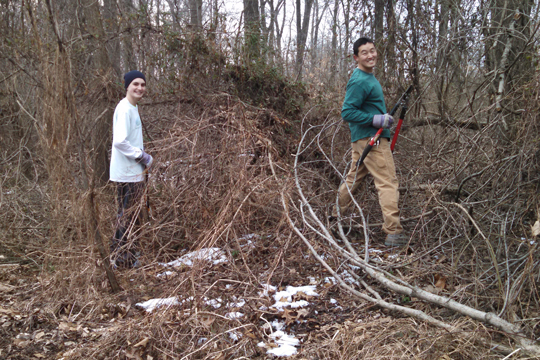 Email info@wissahickoneast.org today for more information on volunteering. Volunteer with one of Philadelphia Parks and Recreation’s Friends groups to help keep a neighborhood park healthy and clean. Friends groups serve as a voice for their respective communities and their volunteer activities include park cleanup days, fundraising, programming organization, park improvements advocacy and much more. Volunteer work is also available at recreation centers in assisting with afterschool programs and sports. To find out how and when you can get involved, contact Yuan Chao Li at Yuan.Li@phila.gov. 1031 Palmers Mill Rd., Media, Pa. Spend some quality outdoors time and make new friends in the process with Natural Lands Trust’s volunteer work. There are opportunities available for either a few hours of hands-on work at a time during a Volunteer Service Work Party or a long-term commitment through the Trust’s Force of Nature Volunteer Program, where volunteers will learn land management, habitat restoration, plant species, and wildlife identification topics over a five class, several month span. 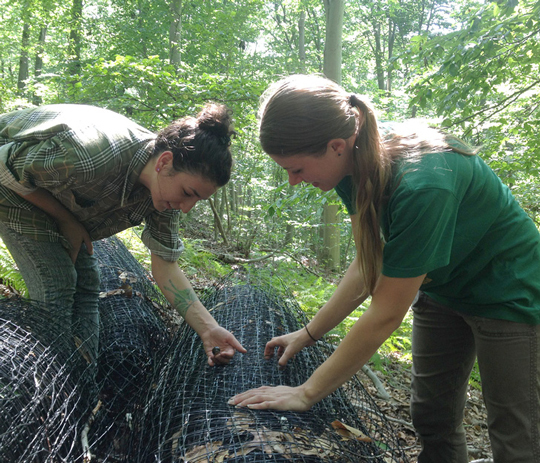 Applications for the 2015-2016 class of Force of Nature volunteers will be accepted this spring. Contact Debbie Beer at dbeer@natlands.org or 610-353-5587 ext. 266 for more information or to be added to the volunteer email list. Suite P-117A, 3451 Walnut St. If you have a passion for food education and physical fitness awareness, Agatston Urban Nutrition Initiative may be the place for you. Volunteer work with the organization could include assisting the cooking crew some evenings, Saturday farm work and special event marketing. To find out more information, fill out a signup form or contact info@urbannutrition.org. Volunteer at the Jewish Farm School’s Philly Farm Crew this spring and spend some time bonding with nature by working in the dirt. 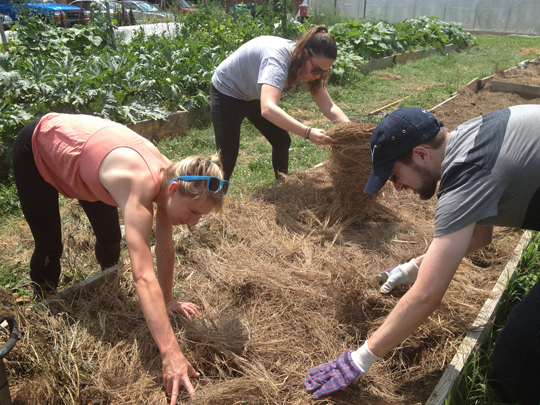 Volunteers will help with a variety of hands-on work in vacant farm lots, gardens and food providers around Philadelphia. To find out about upcoming volunteer days, fill out the volunteer interest form with your availability or contact info@jewishfarmschool.org. Over the next three years, PowerCorpsPHL will plant 3,000 trees and revitalize 3,000 acres of public land. As such, the organization always welcomes volunteers to lend a hand with their technically trained work crews during a number of public events. The work and schedule vary, so contact PowerCorpsPHL@phila.gov for more information. Suite 532, 1315 Walnut St. | 51 N. 12th St.
Join Fair Food in its quest to promote the importance of family farms and keep a year-round marketplace for fresh, local and humane food products by volunteering at their Farmstand in the Reading Terminal Market. The Farmstand is open seven days a week and year-round so volunteers able to work a regular weekly shift are desired. Fair Food also has volunteer opportunities for special events, office work and produce pick up and delivery. Fill out an application and send it to volunteers@fairfoodphilly.org. Looking to do some good? Lend some of your time to Lemon Hill Neighbors during one of their annual events like Philly Spring Clean-up or Love Your Park Week. Volunteer work is also needed for the upkeep of Girard Dream Garden Community Garden. Whether it’s lending some gardening supplies, an extra hand or gardening expertise, all help is welcome. If interested, fill out a contact form with your information. 51 St. and Chester St.
Come lend a hand at Farm 51 and its small-scale educational urban farm and market in Southwest Philly. Help out with gardening or the animals, which include chickens, turkeys and rabbits. Volunteers are also needed at the food stand, which is open 4:30 to 7 p.m. from May to September. To get involved, email farm51philly@gmail.com. PO Box 18911, Philadelphia, Pa. Looking to spend some more time in nature? Friends of the Cresheim Trail is focused on building a multi-use trail in Philadelphia and Montgomery Counties, but they need help doing so. Join them for one of their volunteer workdays on the third Saturday of every month, or for their Third Annual Cresheim Trail Walk on Saturday, March 15. Email Susan Dannenberg at susan@cresheimtrail.org or call 215-715-9159. 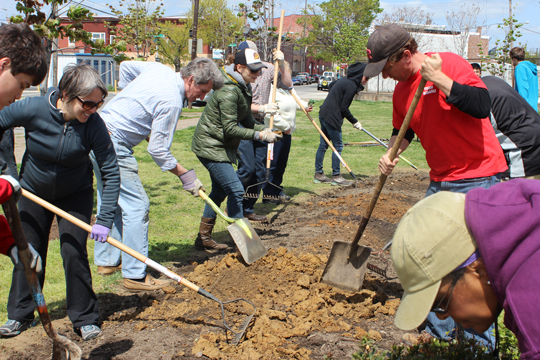 Broad St. and Somerville Ave.
Shevchenko Park needs your help preserving its beauty. Maintained by the Philadelphia Department of Recreation, this small park has opportunities for everyone to volunteer, whether it’s planting, clean-ups or fundraising. Volunteer on your own, bring a friend or a whole group. Fill out a volunteer form to be notified when a park cleanup is organized or email tsparkphilly@gmail.com for more information. There are many volunteer opportunities available at the Schuylkill Center. Gardener volunteers are needed in the nursery to pot plants during the week from March to September. The Senior Environment Corps, for citizens over the age of 55, monitor local streams and meet on the third Thursday of each month. Restoration volunteer days are held on the first Monday, from 9-11 a.m., and third Saturday, from 10 a.m.-12 p.m., every month where volunteers help maintain trails. Other opportunities include working with the wildlife clinic, toad detour and public relations. Email Claire Morgan at 215-482-7300 ext. 120 or claire@schuylkillcenter.org. for more information. Like animals? Botany? Rearch? Artifacts? The Academy of Natural Sciences of Drexel University offers manyvolunteer opportunities. Volunteers can help do things like educate guests about natural science topics or assist scientists in preserving specimens. Some volunteer opportunities, such as research assistant positions, are limited and only given to people with a background in science. Volunteer benefits include free admission to the museum, passes for family and friends, an invitation to the volunteer recognition dinner, and discounts in the gift store and cafe. The Vetri Foundation for Children (VFFC) believes: a healthy body + a healthy mind = healthy living. Help them fulfill their mission through their many volunteer opportunities.Volunteers for Eatiquette lunch program assist in things like meal preparation and are needed Monday through Friday between 10:30 a.m. to 3 p.m. Culinary classroom volunteers assist the instructor in preparing recipes and are needed Monday through Friday between 8 a.m. and 3:30 p.m. My Daughter’s Kitchen (MDK) volunteers work with students during an eight-week session at a school to prepare recipes. MDK volunteers meet one day a week from 3 to 5p.m. with students. Starting in April, VFFC will also be accepting volunteers for their Great Chefs event. Sign up today by filling out a volunteer form or email info@vetrifoundation.org for more information. Riverbend Environmental Education Center relies on volunteers to manage their 30-acre site and teach children about creating a healthier planet. Several hundred people volunteer each year for special events, individual opportunities and a teen volunteer program. In addition to general property maintenance, volunteers have assisted with an extensive woodland restoration project, which has included planting nearly 3,000 trees and shrubs over the past seven years. Volunteers also assist with summer camp programs and administrative work. Fill out this contact page or call 610-527-5234. The Ahimsa House, a group of volunteers, operates through practicing nonviolence and generosity. Help out their cause by leading one of their many workshops, teaching a yoga class or just doing some community outreach. New members are always welcome, so fill out a volunteer form or email ahimsahousephilly@gmail.com to see how you can get involved. PO Box 48 Wayne, Pa.
Help Radnor Conservancy protect open space and natural assets in Radnor Township. Volunteers are needed for community outreach, fundraising and social media. Contact Gretchen Groebel at ggroebel@radnorconservancy.org for more information on how you can engage and educate the citizens of Radnor in sustainable environmental practices. Community gardening, stormwater management or energy efficiency interest you? Rebuilding Together Philadelphia’s purpose is to bring volunteers and communities together to improve the homes and lives of low-income homeowners. Get placed in a volunteer group based on your specific skill set by choosing from a list of volunteer pools currently available. Fill out a volunteer form to sign up and contact Jen Wootten at 302-234-2045 or jenw@rebuildingphilly.org for more information. 1212 Edge Hill Rd. Abington, Pa.
Help Briar Bush Nature Center provide environmental education to visitors. Volunteers are needed for forest stewardship, animal care, manning tables in the community and helping with the butterfly house. Other opportunities include storytelling at seasonal fairs and guiding hikes. Fill out the volunteer form to get started.